Employee Motivation: Achieving Superior Performance in the Workplace Motivating for.. The management need employee motivation studies and approaches in favor of their businesses, by learning the motivation techniques one can pursue a desired behavior for fulfillment of objectives. The simple model of motivation states that behavior can be induced by rewards. There are two types of reward, extrinsic rewards and intrinsic rewards. In an organization management needs to implement motivational strategies to increase the effectiveness and efficiency of its employees. 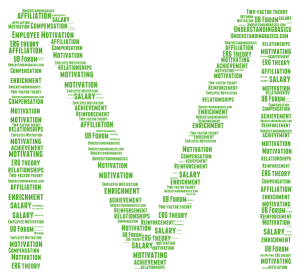 The major perspectives on motivation are content, process, job design and reinforcement. The content perspective states that humans can be motivated through needs which can be physiological or psychological. The need based perspectives cover the Theory X, Theory Y, hierarchy of needs theory, the ERG theory, the acquired needs theory and the two-factor theory. The hierarchy of needs theory has 5 levels of needs physiological, safety, love, esteem and the self-actualization needs. The ERG theory states three basic levels of needs which are existence, relatedness and growth. The acquired needs theory states that the driving force behind motivation are three needs including achievement, affiliation and power. The Two-factor theory states that for motivation the major role is played by two factors which are satisfaction and dissatisfaction. The satisfaction factor covers motivating factors of high level needs like achievement and advancement. The dissatisfaction covers hygiene factor of lower level needs like salary and working environment. The process perspective is linked with thought process of a human. 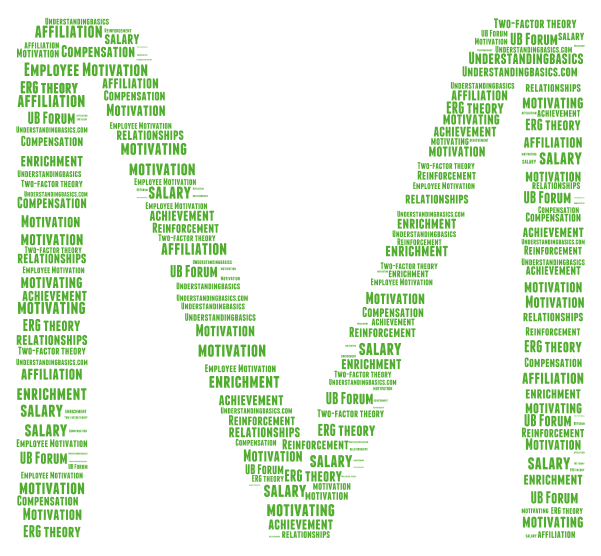 In motivation the process perspective have three theories which are equity theory, expectancy theory and goal-setting theory. The equity theory states that the employees’ perception of fair treatment should be met and there are three key elements of this theory which are inputs, outputs and comparison. The expectancy theory stresses that there are three elements which increases motivation which are expectancy, instrumentality and valence. The goal setting theory states that the motivational factor can be introduced by setting specific and challenging goals but these goals should be attainable. The job design perspective follows an approach which divides the organizational work between employees and by proper division of work, motivational factor can be induced among workers which can lead to increase in efficiency of labor. The job design perspective follows two approaches, one in which people are fitted in job and the other in which job is fitted for people. In the approach where job is fitted to people follows two techniques, one being job enlargement and the other being job enrichment. The outgrowth of job enrichment follows a job characteristic model which consist of five core job characteristics including skill variety, task identity, task significance, autonomy and feedback; which leads to three critical psychological states like meaningfulness of work, responsibility for result and knowledge of results; and work outcomes. For implementing the job characteristic model three steps are followed which are diagnostic of work environment, determining appropriateness and consideration of ways for redesigning job. The reinforcement perspective states that positive behavior can be introduced in employees by positive consequences and negative behavior can be discouraged through negative consequences. In reinforcement perspective there are four kinds of reinforcements which are positive reinforcement, negative reinforcement, extinction and punishment. The positive reinforcement states that management should follow a rewarding attitude toward desirable performance which should be clear and quick. Similarly punishment should be administered on negative behavior.